Evidence that the world's water cycle has already intensified is contained in new research to be published in the American Journal of Climate. The stronger water cycle means arid regions have become drier and high rainfall regions wetter as atmospheric temperature increases. The study, co-authored by CSIRO scientists Paul Durack and Dr Susan Wijffels, shows the surface ocean beneath rainfall-dominated regions has freshened, whereas ocean regions dominated by evaporation are saltier. The paper also confirms that surface warming of the world’s oceans over the past 50 years has penetrated into the oceans’ interior changing deep-ocean salinity patterns. "This is further confirmation from the global ocean that the Earth’s water cycle has accelerated," says Mr Durack – a PhD student at the joint CSIRO/University of Tasmania, Quantitative Marine Science program. "These broad-scale patterns of change are qualitatively consistent with simulations reported by the Intergovernmental Panel on Climate Change (IPCC). "While such changes in salinity would be expected at the ocean surface (where about 80 per cent of surface water exchange occurs), sub-surface measurements indicate much broader, warming-driven changes are extending into the deep ocean," Mr Durack said. "Observations of rainfall and evaporation over the oceans in the 20th century are very scarce. These new estimates of ocean salinity changes provide a rigorous benchmark to better validate global climate models and start to narrow the wide uncertainties associated with water cycle changes and oceanic processes both in the past and the future – we can use ocean salinity changes as a rain-gauge," Mr Durack said. 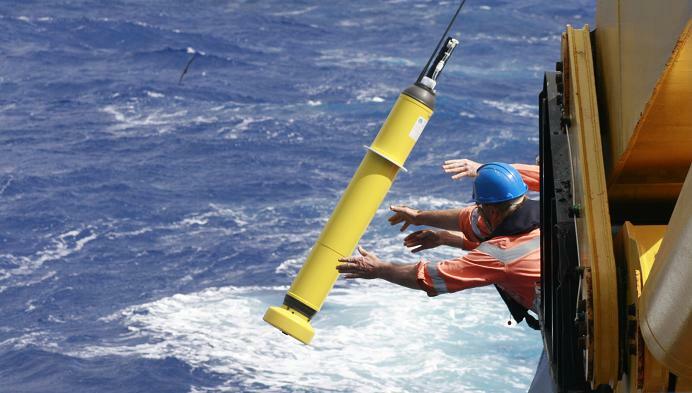 Based on historical records and data provided by the Argo Program's world-wide network of ocean profilers – robotic submersible buoys which record and report ocean salinity levels and temperatures to depths of two kilometres – the research was conducted by CSIRO's Wealth from Oceans Flagship and partially funded by the Australian Climate Change Science Program. Australia’s Integrated Marine Observing System is a significant contributor to the global Argo Program.